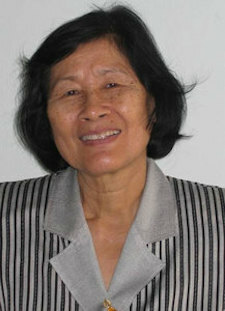 Dr. Suwimon Pukprayoon began as a teacher in private schools in Thailand for 9 years. Then she was appointed by the Ministry of Education as the Special Education Supervisor for Public Schools. She served this role for 30 years. She participated in Special Education seminars in Thailand , Pakistan and Japan. She pioneered teaching autistic children, hearing-impaired children and children with speech impediments, and traveled to Singapore and Australia to acquire new skills to meet their needs. In Songkla and Chonburi she served as the principal for schools for hearing-impaired children and designed books and exercises to teach them Thai language. These books were the first for Thailand and served as a model for other schools. Dr. Suwimon also developed work apprenticeship programs for these youth. Later, as a guidance teacher in Bangkok she taught children with behavioral and emotional problems, and authored First Step, which describes her experiences and guides others to assist youth-in-need. After her retirement, she served as an English teacher in the school for youth who are differently-abled, and later taught at Mahidol University’s College for the Blind. Currently, she works with juvenile delinquent teenage boys who are in custody. She counsels and engages the young men in work therapy. Wherever Dr. Suwimon worked she encouraged students and teachers to plant trees and gardens, a spiritual practice for herself and others. She believes that good and beautiful surroundings for children foster healthy minds and good behaviors. Dr. Suwimon devoted her life to pilot projects in natural resources and human resource development in all the communities she lived in and shared with.